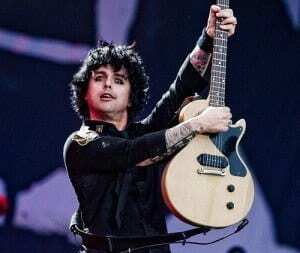 Billy Joe Armstrong of Green Day made a scene during the band’s performance at the iHeartRadio Festival in Las Vegas resulting in a viral YouTube video, a smashed guitar and a trip to rehab. What started with a prompter’s signal to end the band’s performance in one minute concluded with Billy Joe Armstrong giving the middle finger to spectators of the Clear Channel event. Armstrong stopped singing in the middle of the hit song Basket Case to voice his outrage over the limited time for the band’s performance. “One minute left. One minute left. You’re gonna give me one minute? Look at that sign right there. One minute. Let me tell you something. Let me tell you something. I’ve been around since 1988 and you’re going to give me one minute? You gotta be kidding me. I’m not Justin Bieber,” yelled Armstrong, minus the profanities. After venting, Billy Joe Armstrong smashed his guitar into the stage’s floor and stormed off the MGM Grand stage. Two days after his explosive performance at the festival, Armstrong is heading to rehab. Despite the statement’s remorse over the lead singer’s outburst, the media seems to view Billy Joe Armstrong’s actions and words as a righteous display of punk rock fundamentals. Clear Channel and the iHeartRadio Festival endorsed the scene on its Twitter, tweeting “WOW!!! !…and the guitar is officially broken.” IHeartRadio also applauded the performance on the social media site, calling it “one of the most epic, punk rock sets in recent memory” on their twitter. Despite Billy Joe Armstrong’s rehabilitation and Green Day’s postponed performances, Green Day’s new album ¡Uno!, despite Armstrong’s display of anger is said to have an upbeat, pop-infused feel. The album arrives Sept. 25, according the Los Angeles Times. I think that this happy birthday card is fantastic! Thanks for sharing.